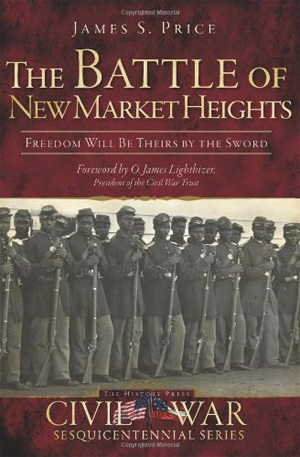 ﻿﻿﻿﻿One of the things that I’m sure nags many Civil War authors is the regret that they feel over not being able to include every detail and account that they unearth during their research for their books. For me, one of the great heroes of New Market Heights who I wish I could've spent more time on was 1st Sergeant Milton M. Holland of the 5th USCI. 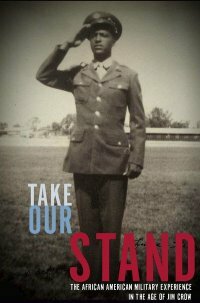 Holland was one of the 14 black Medal of Honor recipients from that historic clash of arms, and his life story is one that I found to be particularly fascinating. Milton Holland was born in Texas, fathered by Bird Holland, a white slave owner who would later fight for the Confederacy. Milton's mother was a slave on the plantation owned by Bird's brother. Milton was one of three brothers that were born from this relationship. 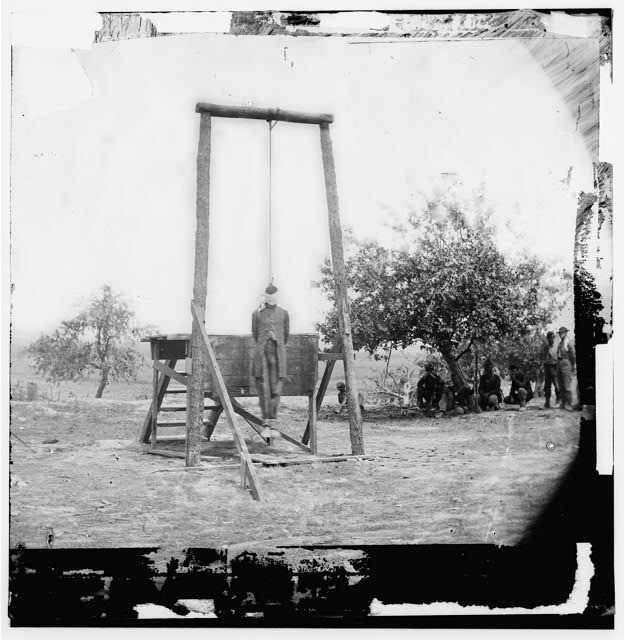 When he and his brothers were young, his father purchased their freedom from his brother, their uncle and slave master, and sent the three boys to a school in Ohio. Holland was still residing in Ohio when Civil War broke out in 1861. 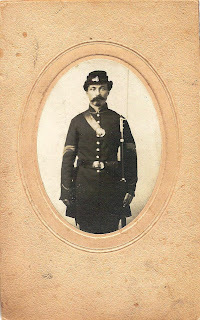 ﻿﻿﻿﻿In what will be the first installment of two posts on Holland’s remarkable life, I will now let the good sergeant give you his story in his own words. 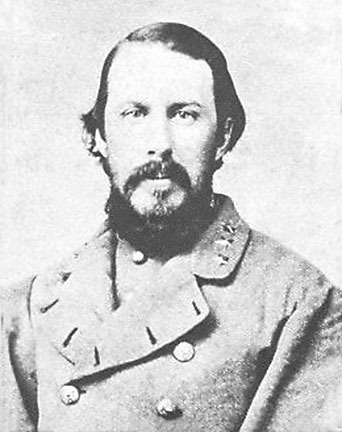 The following comes from a letter that Holland wrote to Lt. Col. Joseph P. Mitchell, who was then compiling information on Civil War Medal of Honor recipients. It is interesting to note that Holland chose to write the letter in the third person. Milton M. Holland was born in the state of Texas in 1844. He was attending school in Athens County, Ohio, in 1861 when the first call was made for volunteer soldiers, and responded to the call of his country. He enlisted in the Union Army in April, 1861, but was rejected on account of his youth. 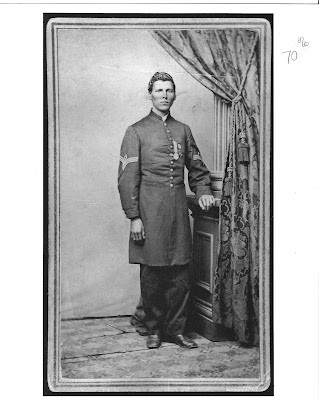 But so determined was he to serve his country that he immediately sought employment in the Quartermaster Department and served under Colonel Nelson H. Van Hores of the 3rd, 18th, and 92nd Ohio Volunteer Infantry. 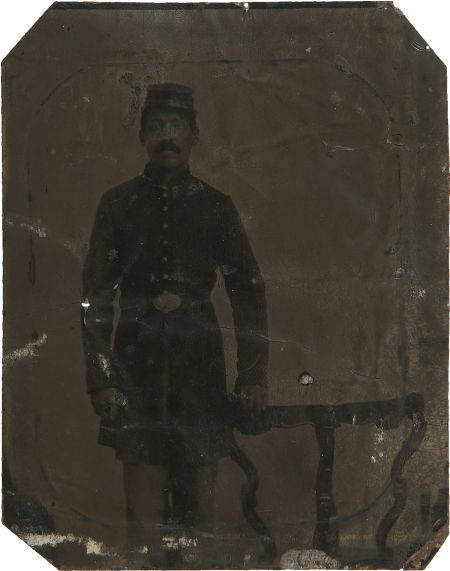 He served in this capacity until he was regularly mustered into the Union Army in June 1863 and assigned to the 5th United States Colored Troops, a regiment raised in Ohio and accredited to that state. Within his regiment he engaged in the campaigns in Virginia and North Carolina under the command of General B.F. Butler. In the winter of 1863 he was with his regiment in the raid through the Dismal Swamp into North Carolina, capturing forage and emancipating slaves under the then recent Emancipation Proclamation. 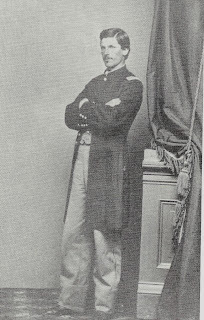 In the early winter and spring of 1864, he was with his regiment in the two raids from Yorktown, Virginia to Bottom’s Bridge just outside Richmond: the first raid being made for the purpose of liberating the Union prisoners confined at Libby Prison; and the second for the purpose of assisting General Kilpatrick who, in his attempt to relieve the Libby Prison men, had been surrounded by the Confederate forces. He was with the James River fleet in its advance on Richmond and, as the fleet approached City Point, Company C, of which Holland was then the 1st Sergeant, was ordered to make the attack. The order was promptly obeyed and, without landing the vessel, the men jumped from the guard rail of the boat, wading water waist deep to reach the point of attack. They captured the Rebel flag, the signal; station and signal officers of the confederacy, thus stricking [sic] the first signal blow at the Rebel stronghold at Petersburg. This regiment was part of the famous Black Brigade which General Smith at first refused to use in his charge on Petersburg on June 15, 1864. General Butler, commanding the corps, promptly ordered General Smith to march on Petersburg and storm her breastworks. 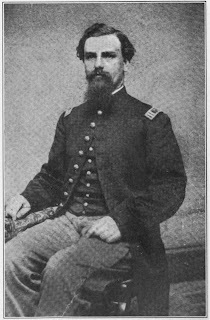 General Smith led the black phalanx in the charge, and for the courage, the heroism, the daring and skill displayed by the colored troops in that bloody fight, General Smith remarked that he would lead men like those into any fight and rely upon their pluck. 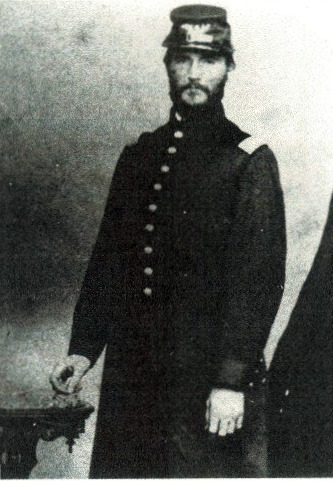 ﻿﻿His regiment was at the ‘Mine Explosion’ [The Battle of the Crater] on July 30, and was prepared to make the charge. They received instructions at a given signal to discharge their guns onto the enemy’s line, jump the parapet and the ditch, and make a charge to cover the ‘Crater’. But just before the signal was substituted in their place. This circumstance, young Holland has ever maintained, lost a key to the Union forces that otherwise would have been gained. It was at this battle that Holland had planned and decided to cover himself in glory. He was sorely disappointed but never relinquished the desire and intention to avail him of the first opportunity. 1st Sgt. Milton M. Holland, wearing his Medal of Honor. Courtesy Rob Lyon. 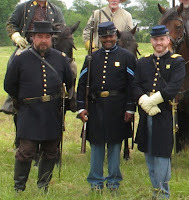 …I humbly submit to you this wonderful video about the 54th Massachusetts. 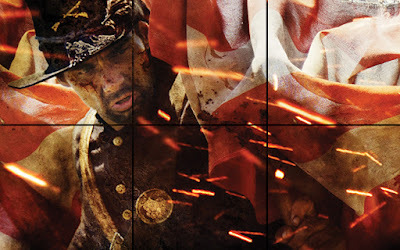 The lyrics are profound, the production is wonderful, and the seamless intertwining of sound clips from the motion picture Glory make this the best original song about the Civil War that I have ever heard in my entire life. First, they have assembled a powerhouse of historical advisors such as Ed Bearss, D. Scott Hartwig, Edward Longacre, John Marszelak, John Michael Priest, J.D. Petruzzi, Gordon Rhea, and Dr. Ronald C. White (and that’s not even all of them – see here for the completer list). With such an all-star team advising the producers, it’s hard to see how there will be any glaring errors or cringe-worthy moments a la the Scott brothers’ recent Gettysburg escapade. 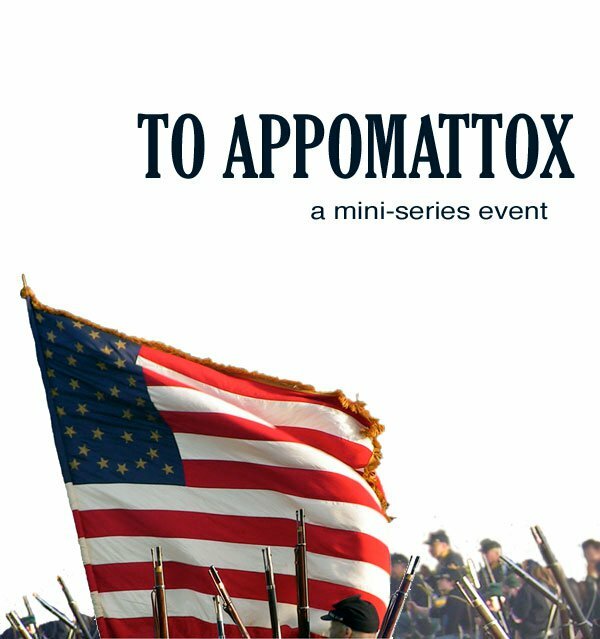 The miniseries is set to debut during the summer of 2013 to coincide with the 150th anniversary of the Battle of Gettysburg and I guess you can say that I’m on the bandwagon now. If I learn more about how much screen time is allotted to USCTs I will certainly pass it on. I was saddened to learn recently that Dr. Edwin S. Redkey died on June 10th at the age of 79. 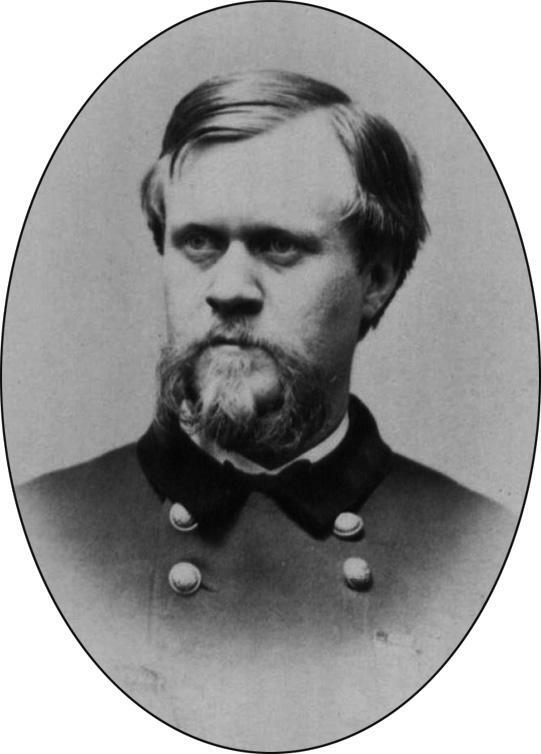 Dr. Redkey was the editor of the classic work A Grand Army of Black Men: Letters from African-American Soldiers in the Union Army, 1861-1865 (1992), a book which inspired Noah Andre Trudeau to write his book Like Men of War: Black Troops in the Civil War, 1862-1865 (1998). Trudeau called Redkey’s book “a revelation in every sense of the word” and used it as one of the starting points for his research. 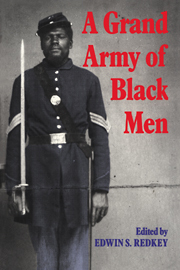 Redkey also contributed an excellent essay entitled “Henry McNeal Turner: Black Chaplain in the Union Army” in Black Soldiers in Blue: African American Troops in the Civil War Era (2002) edited by John David Smith. At noon this Saturday at the John J. Wright Museum, John Hennessy will be presenting a program entitled “Rappahannock Exodus: The 1862 Flight to Freedom and Beyond.” The recreated 23rd USCT is sponsoring this event along with John J. Wright. 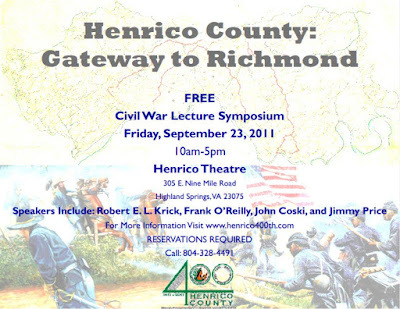 After the talk is over, attendees will have the chance to explore the exhibit "Emancipating Their Homeland: Spotsylvania-born U. S. Colored Soldiers” with the members of the 23rd who will be there in uniform to assist and answer questions. This is a free program, so don’t miss your chance to come and learn about a topic that is already growing in popularity. Hope to see you there! A couple days ago I received an email from someone at “History” (formerly the History Channel) asking if I would promote their upcoming two hour spectacle Gettysburg, produced by Ridley Scott (Alien, Black Hawk Down) and his brother Tony (The A Team, Pillars of the Earth). 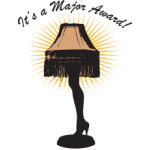 The person from “History” even offered a wide assortment of goodies in compensation for my blog space, including high-end items like t-shirts and hand bags. With such a tantalizing deal before me (I mean who wouldn’t want a white t-shirt with a big “H” on it? ), I wisely listened to the little voice in the back of my head that asked, “Yes, but what if you end up hating it?” and ended up turning down the offer. Needless to say, it’s a good thing I did, because I can now offer you a lighthearted post on how some of my more vociferous and passionate friends on Facebook responded to what turned out to be a disappointing film on many, many levels. Here’s a sampling of what some folks are saying about Gettysburg that had me writhing with laughter. "At least Ridley Scott didnt put laser sighters on the enfields." "seek medical help if this show lasts more than four hours"
"This Gettysburg thing is bizarre! Bad uniforms, beards, hats etc. No one seems to fight in formations. The Rebs apparently all fought in their shirtsleeves. The Rebel yell sounds like a bunch of radical Muslims." "Calling it putrid is an insult to all of the rotten things in the world." "The best thing has been the warning when the show comes back after commercials: "Some scenes may disturb viewers". I find the whole damn mess pretty disturbing." "I think they bought much of the props at the gift shop." "I like Ewell, he looks like a crazy toupee model." Now, in all fairness, I should point out that the historians who were chosen to provide the commentary did an excellent job (it was great to finally see my friend Hari Jones on the History Channel). It was the pairing of such excellent scholarship with awful Hollywood antics, however, that made the film seem disjointed, confusing, and supremely unfulfilling. Kudos to “History” for trying to contribute to the Sesquicentennial commemoration by seeking out high-end Hollywood producers to help generate interest in America’s greatest conflict. And here’s to hoping that they never do it again. 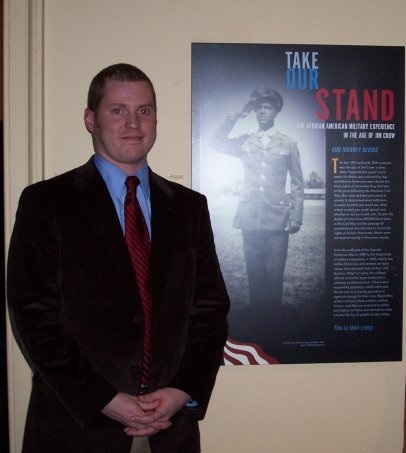 Kudos to Clint Schemmer of the Free Lance Star for his excellent article on Take Our Stand: The African American Military Experience in the Age of Jim Crow. 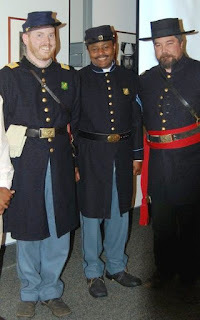 I -- A Bureau is established in the Adjutant General's Office for the record of all matters relating to the organization of Colored Troops, An officer, will be assigned to the charge of the Bureau, with such number of clerks as may be designated by the Adjutant General. 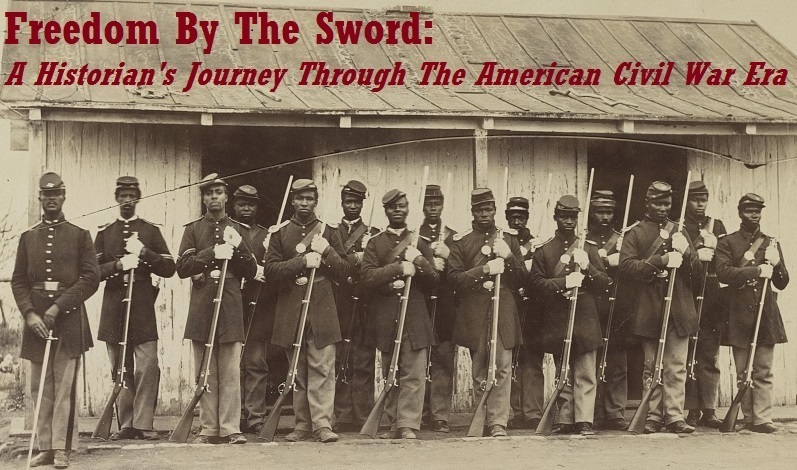 II -- Three or more field officers will be detailed as Inspectors to supervise the organization of colored troops at such points as may be indicated by the War Department in the Northern and Western States. III -- Boards will be convened at such posts as may be decided upon by the War Department to examine applicants for commissions to command colored troops, who, on Application to the Adjutant General, may receive authority to present themselves to the board for examination. IV -- No persons shall be allowed to recruit for colored troops except specially authorized by the War Department; and no such authority will be given to persons who have not been examined and passed by a board; nor will such authority be given any one person to raise more than one regiment. V -- The reports of Boards will specify the grade of commission for which each candidate is fit, and authority to recruit will be given in accordance. Commissions will be issued from the Adjutant General's Office when the prescribed number of men is ready for muster into service. VI -- Colored troops maybe accepted by companies, to be afterward consolidated in battalions and regiments by the Adjutant General. The regiments will be numbered seriatim, in the order in which they are raised, the numbers to be determined by the Adjutant General. 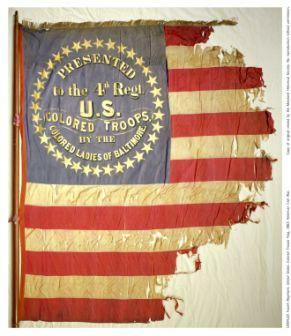 They will be designated: "——Regiment of U. S. Colored Troops." VII -- Recruiting stations and depots will be established by the Adjutant General as circumstances shall require, and officers will be detailed to muster and inspect the troops. 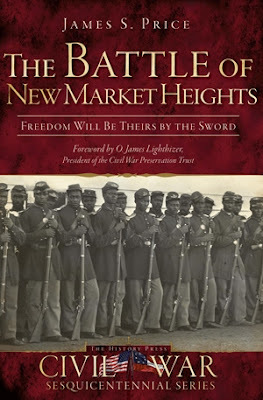 VIII -- The non-commissioned officers of colored troops may be selected and appointed from the best men of their number in the usual mode of appointing non-commissioned officers. Meritorious commissioned officers will be entitled to promotion to higher rank if they prove themselves equal to it. 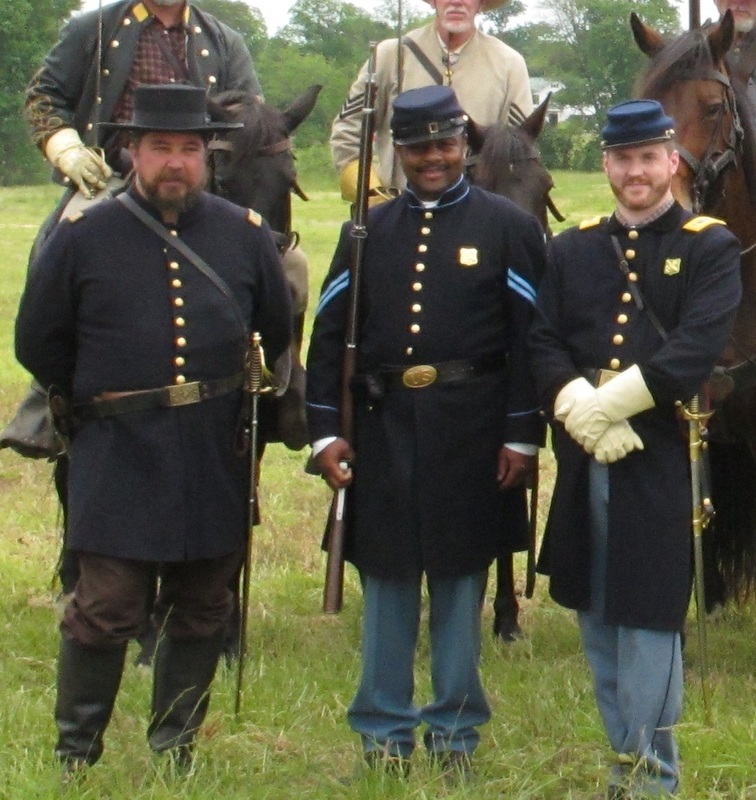 …stop by and meet the members of the newly formed 23rd United States Colored Troops living history group! 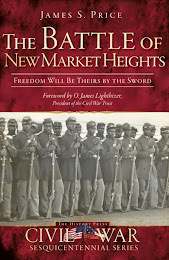 We’ll be scouring the crowds looking for potential recruits and educating the public about the history of the 23rd and of USCT history in general. 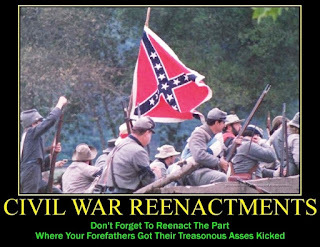 If I was a Civil War re-enactor and I happened upon Dr. Glenn W. Lafantasie’s Sunday article over at Salon.com entitled “The Foolishness of Civil War Reenactors,” I think I might have been offended. I am a Civil War re-enactor and I was offended. In a meandering article that covers the controversial events that took place during the Fort Sumter commemoration last month, a spiteful dressing down of just about every re-enactor who has drawn breath since 1865 (the good doctor doesn’t seem interested in balancing his portrait with re-enactors who are sane, well-adjusted individuals presumably because he doesn’t think they exist), a brief overview of Lafantasie-approved reading on the conflict, and a lament over the month-old sesquicentennial, Lafantasie succeeds mainly in sounding like one of those out of touch academics that Southern heritage types are always crowing about. He stumbles right out of the gate when he tries to give us “normal folk” a helpful definition of “what living history means.” Living history involves people “dressing up in Union and Confederate uniforms and acting out battles and other significant events that occurred between 1861 and 1865.” Not quite true – living history events are usually more casual happenings with no recreated battles in which the detested re-enactors set up camp and demonstrate life on the field and on the march. 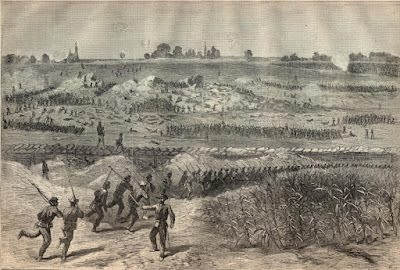 A battle re-enactment is an event where a specific battlefield scenario is recreated, such as the one that happened at Fort Sumter to Lafantasie’s everlasting outrage. 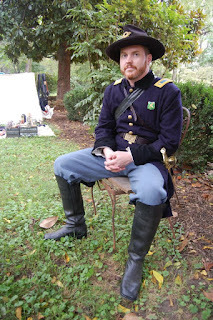 Many folks who have been in the hobby a while (myself included) will tell you that they prefer living history events because they are more laid back and offer better opportunities for interacting with the public. “Powder burning fests,” as they are sometimes called, tend to attract the subspecies of re-enactor commonly referred to as a “yahoo.” This type of re-enactor cares little for authenticity and wants to shoot his musket as often as he can so that his childhood fantasy of being Josey Wales will finally be realized. I suspect that this is the type of person that Dr. Lafantasie has so much pent up annoyance over. Well, I shouldn’t need to point out that not every re-enactor out there thinks that such a commemoration would be a “good thing.” I guess in Lafantasie’s world there are no Union re-enactors at all, just long-bearded country folk running around shooting at the air and cursing that tyrant Lincoln. Ramping up his rhetoric, he states that re-enactors “live and breathe the war readily, without hesitation, and with a passion that veers close to a religious experience or even sexual arousal.” All of this “strikes [him] as perverse,” and I must admit that if I ever attend an event where re-enactors are flaunting their sexual arousal, I will be the first one to lead a bayonet charge back to the parking lot and fight my way out at all costs. 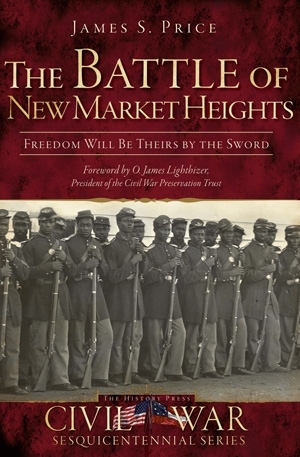 As the article continues to develop, the author makes more broad, sweeping statements that prove his lack of familiarity with how the hobby actually works and while he decries the violence that these battle re-enactments allegedly celebrate, he also criticizes them for being bloodless, snarkily describing how “the faux dead and wounded on the field rise up in a mass resurrection resembling the Rapture.” Unless Lafantasie wants real combat fatalities to occur at re-enactments, I’m fairly sure that this is unavoidable and the spectators (who Lafantasie also throws under the bus, comparing them to fans of professional wrestling) really are intelligent enough to draw distinctions between the modern day and 1861. 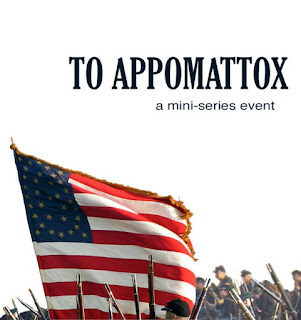 Throughout the article, Lafantasie suggests venues other than Civil War re-enactments where people can come and learn to truly appreciate the history of the Civil War. 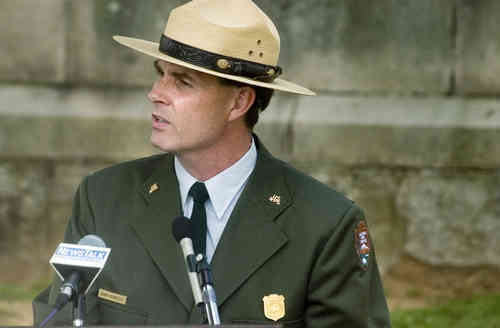 He rightly suggests that National Parks are a good place to start. But doesn’t Lafantasie know that the NPS relies on re-enactment units on a regular basis to bolster their programs? 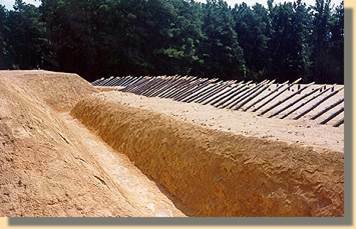 Attend the wonderful living history weekend held by Richmond National Battlefield at Cold Harbor one June and you will see what I mean. 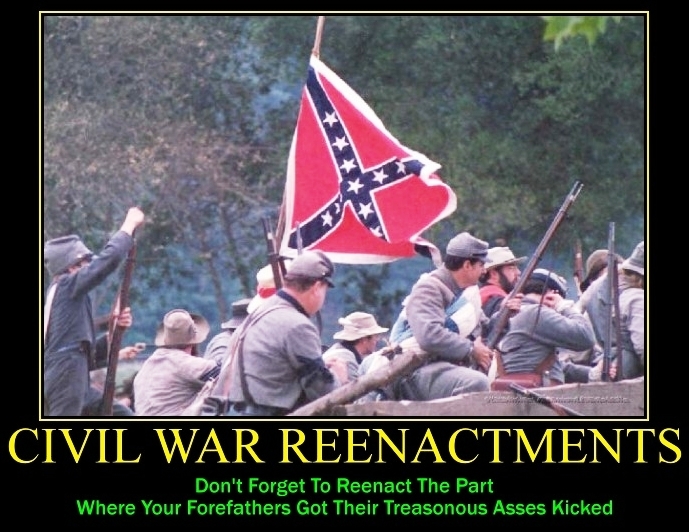 The article mercifully ends with a nearly incoherent rant about birthers, the Tea Party movement, and immigration reform which is sure to earn him points with some of his fellow academics while leaving the rest of us to think that all Civil War re-enactors are right wing racist lunatics hell-bent on destroying the “true” legacy of the Civil War. For someone who seems to have such righteous indignation over people who lump entire groups of individuals into one category and discriminate against them, that is exactly what Lafantasie has done with Civil War re-enactors. Respected re-enactors who are still with us like Greg Urwin and Dana Shoaf, in addition to those who are no longer with us like Chuck Hillsman and Brian Pohanka stand out as sterling examples of re-enactors that don’t fit Lafantasie’s mold. And, like it or not, re-enactors will play a large role during the sesquicentennial commemoration. Perhaps it would be best to ensure that only the most respected re-enactment units out there are invited to participate in important events rather than denigrating them all because of one event that took place in Charleston last month. I’m just a foolish re-enactor.